While everyone loves affectionate cats and playful dogs, the thousands of varieties of fish commonly kept as pets are often under appreciated and underrated, not getting the love they deserve as loyal companions. If there is one thing that makes fish easier to appreciate, it is providing them with a home that will wow not only its inhabitants, but the curious humans who come into contact with it as well. 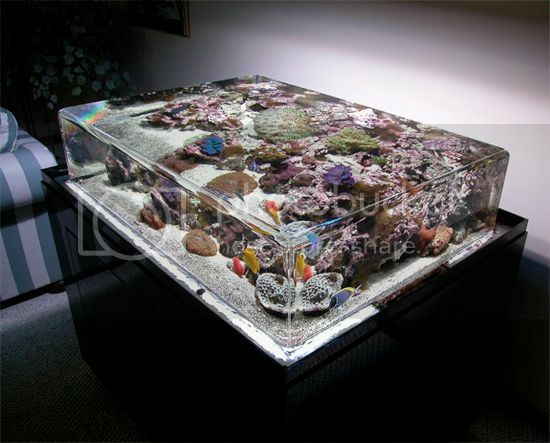 If you’re into pet fish and their wild variety of homes, check out these 10 wicked aquarium designs! 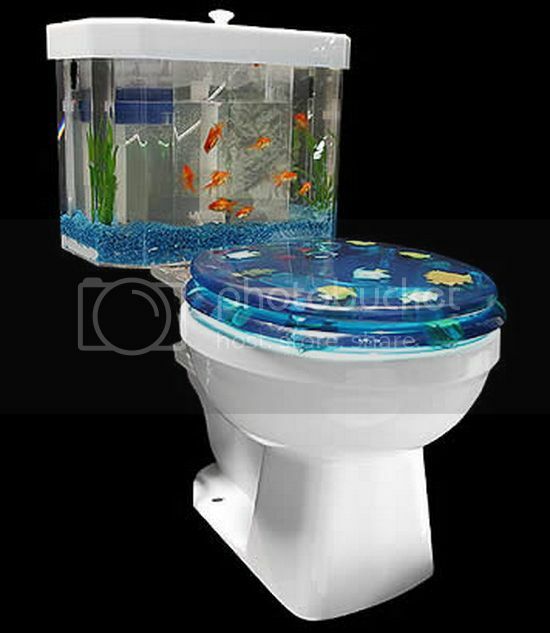 Not only an awesome aquarium visually, the patented Fish ‘n’ Flush aquarium toilet also functions as a working toilet, ensuring no one in your household ever suffers through a boring bathroom trip again! 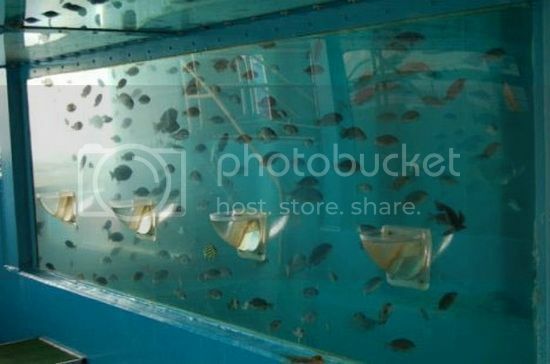 Offering 2.2 gallons of tank space, the aquarium toilet features the illusion of water draining from the fish tank when flushed; the fish are actually quite safe while it is a separate tank doing the draining. 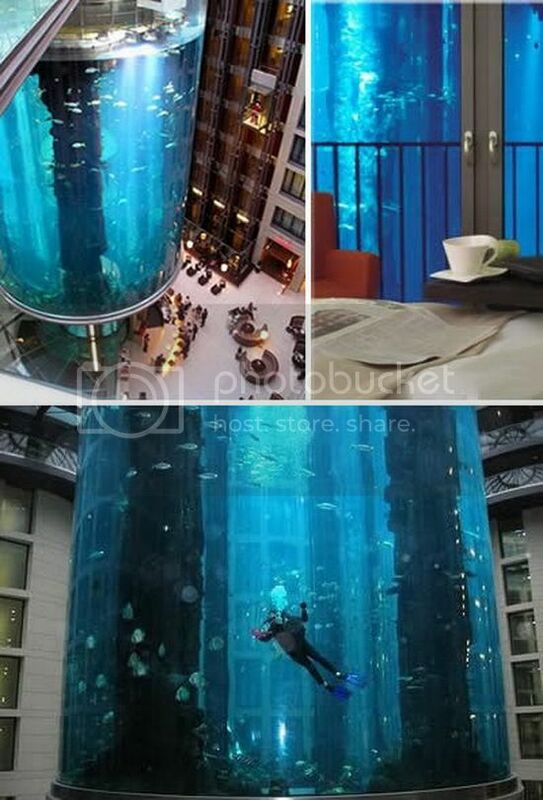 Visitors to the Radisson SAS Hotel in Berlin, Germany are greeted to the world’s largest cylindrical aquarium immediately upon entering its lobby. Large enough to accommodate several divers at once, the AquaDom holds more than 900,000 liters of salt water and plays host to more than 2,500 fish from over 50 species. Located in Oita City, Japan, this huge tank doesn’t offer the same fancy form factor and additions that you may expect on a wicked aquarium, but what it lacks in visual appeal it makes up for in functionality. The tank features several “feeding cups,” holes, without coverings, placed directly in the side of the tank. The wonderful laws of physics, the tank’s carefully maintained water pressure in particular, keep the water from gushing out, allowing visitors to place food in the cups and watch the fish eat. Full disclosure: this isn’t a real aquarium. 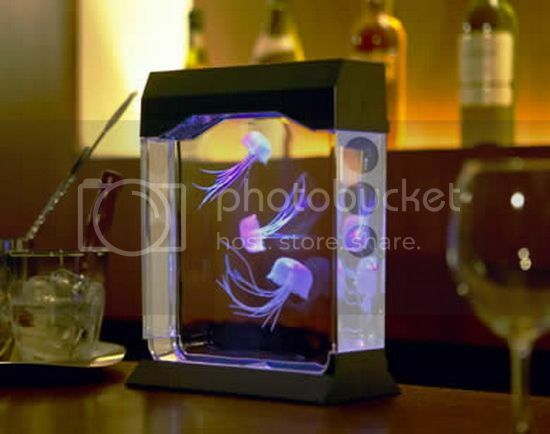 It is, however, a fantastic visual representation of a small aquarium holding two jellyfish, all achieved by a clever use of light and water. 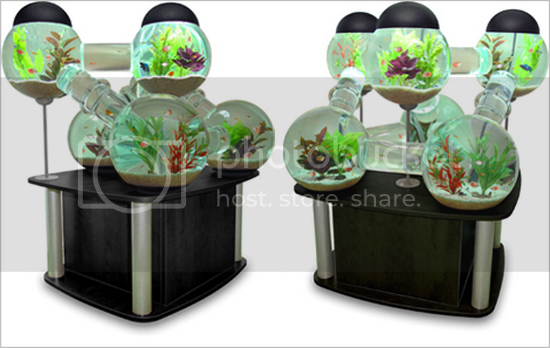 This consumer aquarium makes for a cozy abode with modular pieces separating each tank area from the other, providing its inhabitants with eventful surroundings and its admirers with a beautiful visual effect. Well-suited to apartment dwellers, the biOrb Life Aquarium not only houses your fish but also uses an array of LED lights to mimic the daily cycle of the sun, allowing fish to remain healthy and happy even in a dark corner. 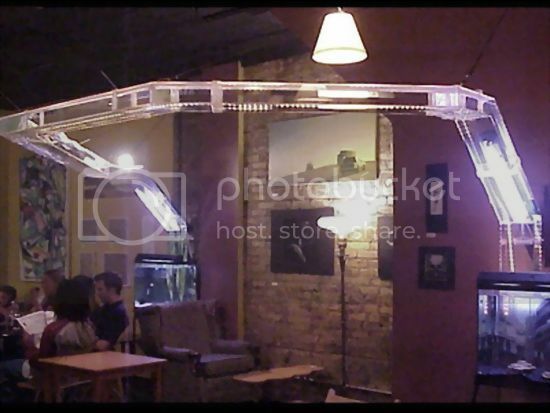 A home project intended to allow fish to travel from one tank to another, the so-called “fish highway” does just that, making for a cool design effect with an overhead water tunnel that provides fish with a roadway spanning several rooms. Made entirely of glass, this aquarium gives the appearance of free-standing water while giving fish a full view of the world around them. 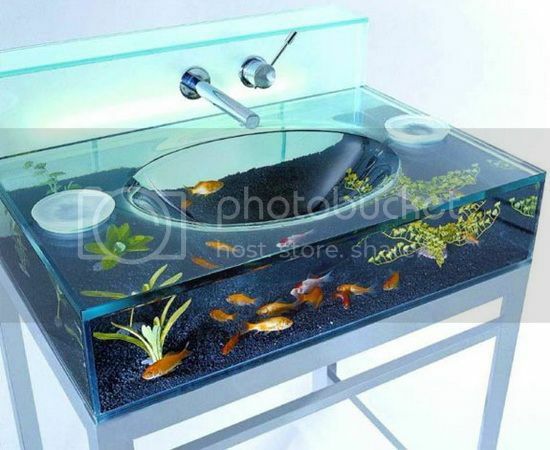 Matching quite nicely with our first entry is this very cool aquarium sink, a formed-glass construct offering a fully functional bathroom sink and an aquarium in one beautiful piece. 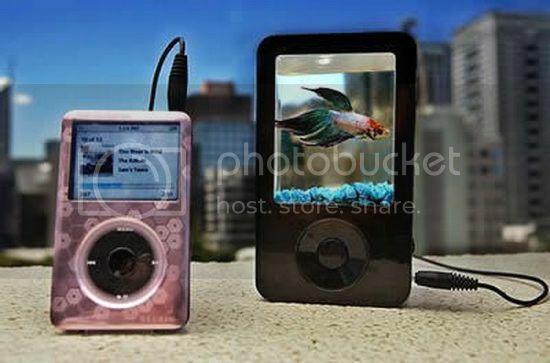 Perhaps not appealing to the animal lovers out there given the backlash against this consumer aquarium in Australia, the iPond is an Apple iPod accessory that attaches a tiny speaker and aquarium to your mobile music player with a live fish making a home in the 650 millilitres of water. While cool in theory, the small amount of water means that the fish cannot possibly receive enough oxygen to live a long life, prompting officials to call for a ban on this otherwise clever design.